The harbor seal is a true seal, found widely distributed along coastal waters. The Eastern Pacific Harbor Seal (Phoca vitulina richardsi) is a subspecies of the harbor seal and is distinguished by residing in the waters of Western North America. Seals who reside in the Puget Sound also possess unique genetic divergence from seals found on the coasts of Washington, Oregon, and California. An Eastern Pacific harbor seal hauled out in Woodard Bay Natural Resoources Conservation Area, Olympia, Washington. The body and flippers are short, with a proportionately large, rounded head. The nostrils appear distinctively V-shaped; as with other true seals, there is no ear flap, or pinna. Females are generally smaller than males, and they also tend to outlive males. Harbor seals generally do not live longer than thirty years. In water, harbor seals use their hind flippers for propulsion, while on land their method of locomotion is a caterpillar-like undulation utilizing their fore flippers for momentum. Pups are born in the summer, though timing varies through the areas. In the South Puget Sound, peak birth rates occur mid-July into September. By age four or five, female seals produce one pup per year and care for it themselves. Pups are often playful immediately after birth, capable of swimming and following their mother into the water, where harbor seals feel most safe. Nursing lasts 4 to 6 weeks, then weaned pups are left to forage for themselves. Harbor seals generally are non-migratory, with local movements associated with tides, weather, season, food availability, disturbance, and reproduction. They use a variety of sites to haul out, or rest, near the water for safety. Harbor seals are generally opportunistic feeders, so they inhabit near-shore areas that provide adequate prey. Their diet consists mainly of fish and squid, though it varies from one area to another depending on availability. Because they are near the top of the marine food web, harbor seals accumulate significant amounts of mercury. High concentrations of chemical compounds like PCBs and DDT have also been found frequently in harbor seals. They are useful indicators of contaminant levels due to their nearshore anthropogenic habitats and high-level trophic consumption. Marine mammals, including harbor seals, are protected under the Marine Mammal Protection Act of 1972, therefore it is illegal to hunt, harm or harass any species of marine mammal in U.S. waters. 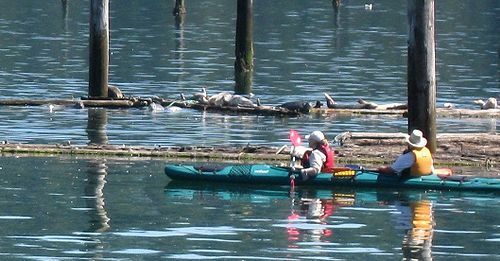 The most critical period for harbor seals in the Puget Sound is July and August when pupping is occurring and September to October when seals are molting. Disturbance rates are highest during summer months, weekend days, and weekday evenings, reflecting how human interaction still affects the harbor-dwelling pinnipeds. ↑ Lamont, M., J. Vida, J. Harvey, S. Jeffries, R. Brown, H. Huber, R. Delong, W. Thomas. 1996. 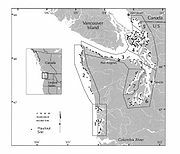 Genetic Substructure of the Pacific Harbor Seal (Phoca vitulina richardsi) off Washington, Oregon, and California. Marine Mammal Science. 12:3. 402-413 pp. ↑ Lambourn, D. (n.d.). Wildwatchcams: seals. Washington Department of Fish and Wildlife. Retrieved from WDFW website 2-21-2011. ↑ Jeffries, S., P. Gearin, H. Huber, D. Saul, D. Pruett. 2000. Atlas of Seal and Seal Lion Haulout Sites in Washington. Washington Department of Fish and Wildlife, Wildlife Science Division, 600 Capitol Way North, Olympia WA. 150 pp. ↑ Brookens, T., J. Harvey, T. O’Hara. 2007. Trace element concentrations in the Pacific harbor seal (Phoca vitulina richardii). Science of the Total Environment. 372:676–692 pp. ↑ Calambokidis, J., S. Jeffries, H. Huber, G. Steiger, J. Evenson. 1991. 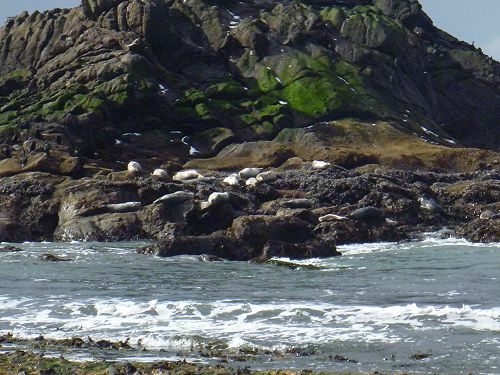 Censuses and Disturbance of Harbor Seals at Woodard Bay and recommendations for protection. Prepared for WDNR. Olympia, Washington. 45 pp. This page was last modified on 7 March 2011, at 18:24.